Bori are one of many different species that exist in Neopia. As a general rule Bori are quiet peaceful creatures who are rather timid. They originated from the frozen region of Terror Mountain, but can now be found all over the world. As well as your basic four colours, Bori come in a wide variety of shapes and sizes ranging from the festive Island Bori to the red hot Fire Bori! In order to own one of these more unusual Bori you will need to find a magical paint brush or potion. Despite his miniscule frame Armin managed to greatly aid Hannah during her time in Terror Mountain. Proud leader of the Bori tribe. The Keeper stays alert for any trouble that may threaten his people. 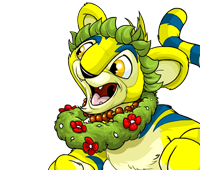 The Hannah and the Ice Caves expansion of the Neopets Trading Card Game features many Bori. For more Bori related products, please check our Online Catalogue. If you are interested in finding out more about anything in Neopia (including Bori), the Neopedia is a good place to start. There is a link to the Neopedia from the front page of the site, or just type in the word/species you are looking for in the search box in the yellow bar.